At the end of March, I will leave the University of Brighton after just over a decade. There are many things I will miss – the people, the collegiality and the creativity, culminating in the amazing work inside and outside lecture theatres and labs. When you look at the Higher Education environment today, it’s a challenging time. On a number of fronts. But without exception, every year I am reminded just what universities are all about, thanks to our graduation ceremonies. Happening twice a year, in winter and summer, these ceremonies are a chance to celebrate achievement, to recognise hard work, to spend time with our supporters and also, to reflect. The Friday before last (8th February) saw me attending my last graduation ceremonies as a member of University of Brighton staff. And as always, the day brought plenty of joy, happiness and pride. Though the weather outside was rather a different affair…! As the Director of Philanthropy & Alumni Engagement, I take a lead on hosting duties at graduation. Whether hosting our soon-to-be honorary graduates, our wonderful keynote speakers (who kindly give up their spare time to share their wisdom and experiences) or our generous supporters, those individuals and companies who choose to give (both financially and in-kind) to help advance the university and in support of our talented students. For the morning ceremony, we welcomed newly reconnected alumna, Sonia Cargan (Chief Diversity Officer for American Express and BA social admin, class of 1991) as our keynote speaker. Sonia attended graduation with her husband, Martin – also a University of Brighton graduate having secured an MSc in Information Systems in 1996. 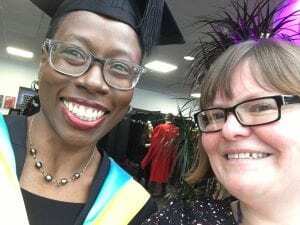 Sonia joined us as part of the platform party for the ceremony during which students graduated from Health Sciences, Brighton and Sussex Medical School, our Hastings campus partner colleges, Computing, Engineering & Mathematics and Sonia’s own subject area Applied Social Science. 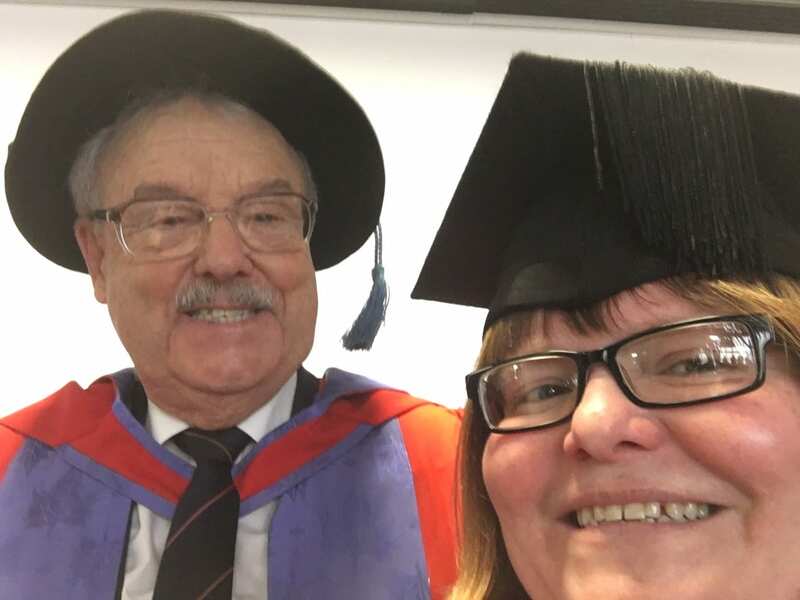 We also had a number of supporters joining us for the morning ceremony – Michael Chowen is one of the university’s honorary graduates and a long- standing supporter, having donated to a range of research and student opportunity projects. Having him attend this ceremony was even more significant as Friday 8th February was his birthday! 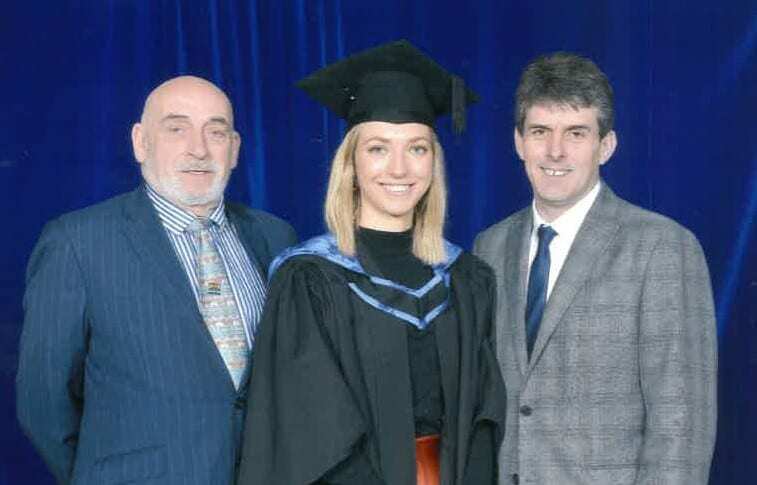 James Wright and Paul Wardle of Streamline Taxis attended the ceremony to see Tamsin Cull graduate in Nursing (Mental Health). T amsin was the first recipient of a new graduation prize sponsored by Streamline Taxis for the top performing final year student on her course. Jon Withnall from FDM Group attended the ceremony to see Nik Papageorgiou and Brook Woldeyohannes graduate in MSc Applied Computer Science – both Nik and Brook are part of FDM’s graduate programme, which links directly with this degree, established in partnership with FDM a number of years ago. After lunch, the good vibes continued, though unfortunately the weather didn’t really improve. We welcomed alumnus Chris Riddell to the afternoon ceremony to receive an honorary degree from the university. Chris graduated from the then Brighton Polytechnic in the mid 80’s and has gone on to receive numerous awards and accolades for his illustration and writing, particularly of children’s books. Chris was the UK’s Children’s Laureate from 2015-17 and remains the political cartoonist for the Observer. The afternoon ceremony saw students graduate from Brighton Business School, Architecture & Design, Education, Environment & Technology, Humanities, Media, Pharmacy & Biomolecular Sciences, Sport & Service Management and Chris’ own school, Art. 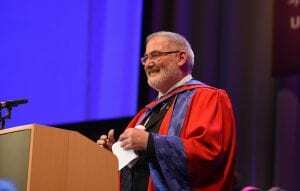 One of the real pleasures I have had over the years here is when I have been asked to deliver orations for our honorary graduates and so was delighted to have the chance to make my final oration for Chris at last week’s ceremony. Commenting that the current climate provided regular materials for political cartoonists, Chris also advised our newest graduates that, “…when things get tough, this is what you should do…make good art. I’m serious.” For Chris, regardless of sector or discipline, we all have the ability to be creative, which helps in the good times and also when things are more challenging. As you can imagine, the operation that delivers these joyful ceremonies is a well-oiled one with numerous colleagues going above and beyond to ensure the occasion is enjoyable for both our graduates and their supporters, creating memories for many years to come. The colleagues who register guests on arrival, those who act as stewards inside and outside the auditorium to make sure everyone is in the right place at the right time (and in the right order! ), and the team who transform the main event space into a welcoming and vibrant venue fit for such an important event. All inv olved contribute in their own way. I want to pay particular tribute to my own team – the members of Philanthropy & Alumni Engagement – for their part in the university’s graduation ceremonies. 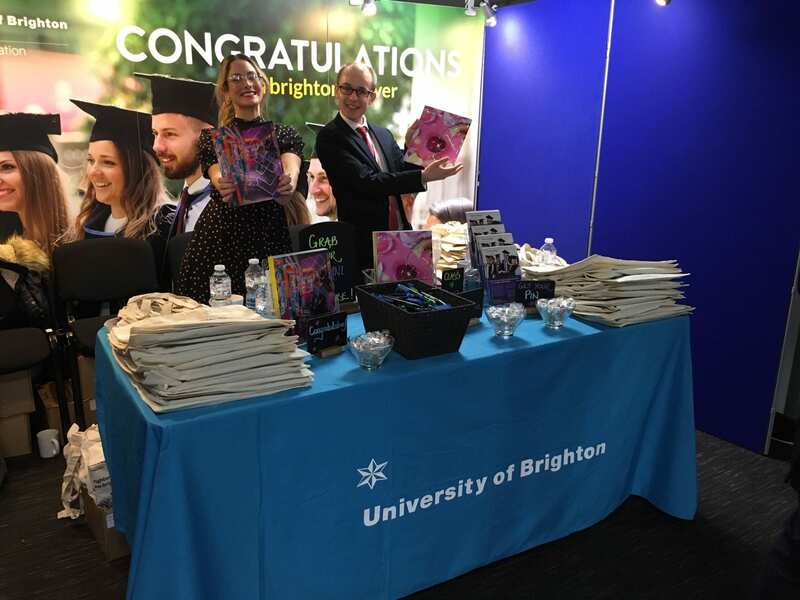 We always set up an alumni association information stand from 8am until 6.30pm for all ceremony days at which my happy colleagues give out alumni pins, information about benefits for new graduates and the copy of latest Brighton Effect magazine – as well as generally encourage graduates to stay in touch. Back at the ranch in Mithras, the team field the influx of queries coming into our alumni inbox after graduation and arrange for the pre and post graduation email messages to be sent out. All in all, a true team effort. As I said at the beginning of this blog entry, I will miss a lot of things about my time at the University of Brighton and for me, graduation sums up all that makes this place so special.